Occasionally, airlines will make a mistake when publishing fares. This happens once or twice a year and usually lasts only a relatively short time. This time, two mistake fares happened in rapid succession, one with Alitalia and another with American Airlines, and both the same sort of fare mistake. The Alitalia mistake fare represented a considerably better value and I booked it. I am traveling all the way around the world for just $450.30 in cash and I will earn miles while doing it. This is like paying under $219! Note: These fares are no longer available. I first became aware of the mistake fare when I saw a tweet from @TheFlightDeal alerting me to it. If you’re not using Twitter to find good deals on flights, you’re really missing out! The people behind this particular account are really, really good. They research and publish exceptionally low fares to a number of destinations. In this case, they didn’t find the deal; someone who posted on FlyerTalk in the Mileage Run Deals forum did. However, they published it quickly after it was posted. Note that for mistake fares, minutes matter. You need to move very fast or you usually will not be able to get them at all. In this case, the mistake fare was of a type called a “fuel dump.” If you booked a ticket with an Alitalia segment using a particular fare construction on Priceline, the fuel surcharges were not included on the ticket–just the actual fare and taxes. And this presented an incredible opportunity. For a variety of reasons (most of them involving tax dodges and none of them particularly scrupulous), airlines publish very low fares, and most of the cost of a ticket is billed as a “fuel surcharge.” If you can find a way to book a ticket without paying the surcharge, you’ll often end up getting a really inexpensive fare. Generally speaking, airlines have to honor mistake fares if they originate or terminate in the United States. Taking your money and issuing a ticket constitutes a contract in the US, and airlines can’t get out of a contract just because they wish they hadn’t entered it. After all, if you want to get out of the contract, airlines don’t offer any flexibility either. To get this particular mistake fare, you had to start in Los Angeles or New York, fly at least half of the itinerary on Alitalia-marketed segments (note this doesn’t mean you had to fly Alitalia, just on flights using their flight number), travel into either Milan, Prague, or Budapest, break your journey with a stopover and/or an open jaw, and finally end up in an Asian city. And obviously, this was a one-way fare only. “Fuel dumps” tend to be complicated things like this, where at some point the creaky legacy systems that price and sell tickets break down and something important (like a fuel surcharge) breaks out of the “fare construction,” as it is called in industry parlance. The upshot? I’m flying from Los Angeles to Boston on Delta, changing to Alitalia flights onward to Rome and Budapest, staying a week, and then continuing on from Budapest to Beijing on KLM and China Southern via Amsterdam (with a 22-hour layover in Amsterdam, enough time to visit friends). The total fare was $362.90. This is actually not the cheapest fare that was offered; some people were able to arrange one-way journeys to Asia (typically from New York to Milan and then onward to Tokyo) for as little as $127. Most of the exceptionally low fares like these involved a lot of searching, with the risk that the deal would die at any moment. I worked very quickly, grabbing tickets for dates that I knew would be personally good for me and booking immediately before the deal disappeared, which turned out not to be a major concern. This particular deal stayed alive for over 24 hours. All of the tickets issued are being honored, no matter how low the fare, and they even qualify for frequent flier credit. Incidentally, American Airlines made the exact same mistake with fuel surcharges–to the same part of the world–the very next day. Fares to eastern Europe clocked in as low as $500 roundtrip, depending on your originating city. The fuel surcharge was dropped when at least one segment of the journey had an American Airlines flight number when traveling on a US Airways flight. This problem was fixed within a few hours, but not before hundreds of cut-rate tickets were sold. “So,” you may ask, “That’s great, and congratulations, but you’re ending up in Beijing. Unless you’re moving there, what is your plan to get home?” This is where miles and points can come in very handy, as long as your frequent flier program allows ticketing one-way awards. I currently have miles and points with the Alaska, American and Avianca programs which allow one-way ticketing. However, I am just short of the number of American Aadvantage points required for an economy ticket from Beijing to Los Angeles, and I am also short in my Avianca LifeMiles account because US Bank hasn’t credited my account with the promised 20,000 bonus miles for their credit card signup. While Avianca would let me buy up to the number of miles required, it wasn’t a very attractive option, so I decided to use my Alaska Airlines Mileage Plan miles. The best one-way option to the US from China on Alaska Airlines is by flying Cathay Pacific. It costs only 30,000 miles for an economy-class seat from Asia to the US. However, I just flew in Cathay Pacific economy class last week from Hong Kong to Los Angeles, and it wasn’t particularly comfortable. Part of this was due to the very obese woman next to me who insisted on putting her dirty feet on the bulkhead the whole way while spilling into my seat, but part of this was the 10-across seating, indifferent service, and poor food quality. However, for 35,000 miles, Alaska Airlines offers an award in Cathay Pacific premium economy–if you can find the space. This isn’t easy to find, and Alaska Airlines doesn’t publish Cathay Pacific space online. You have to call, and it’s really “hit or miss” (mostly miss) with the agents when you call them. They are all friendly and will typically go out of their way to help you if you know exactly which flights you want, but they aren’t always particularly good at searching for award space. 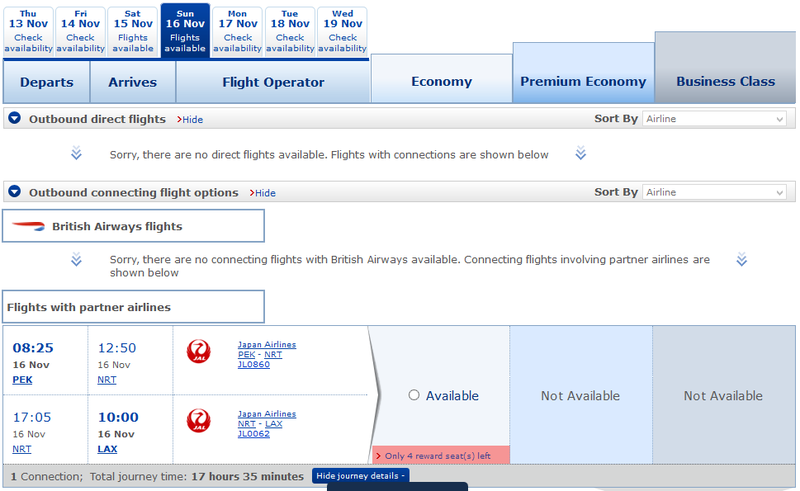 Now there’s suddenly availability, and there is even a seat in premium economy! We now know we can get from Hong Kong to Los Angeles. All we need to do is get from Beijing to Hong Kong in order to complete the flight. Unfortunately, this isn’t particularly easy on a Cathay Pacific award, because most flights between Beijing and Hong Kong are operated by Cathay’s Dragonair subsidiary. There are only two Cathay Pacific flights per day, and you can only use those with an Alaska Airlines award. Also, the earliest Cathay Pacific flight on Sunday morning arrives after the morning flight from Hong Kong to Los Angeles leaves. Hmm. If you spend less than 24 hours in Hong Kong, it’s a layover, and not a stopover. This is a very important distinction. Could I go from Beijing to Hong Kong on Saturday and enjoy a visit to Hong Kong as well? Why yes, I could! I called Alaska and booked it. As I expected, the Boise-based agent was very friendly but had never booked such a complicated itinerary before and had no idea what the rules were. I opted to book in premium economy, which is a rare excellent value. If you paid for this fare, it is priced at about $1,000 more than an economy class ticket, but costs only 5,000 extra miles. For a nearly 17-hour flight, the upgrade is actually worthwhile (I almost never consider an upgrade worthwhile, but in this case, I believe it was). The best part? Alaska Airlines allows a stopover anywhere in North America that they serve, as long as your continuing flight is only on Alaska Airlines flights, and it’s available at the “saver” award level. Since I knew I needed to go home to Seattle for Christmas, I added on a flight from Los Angeles to Seattle on Christmas Eve. Alaska had plenty of “saver” economy level availability for this flight. So, my award is technically from Beijing to Seattle with a stopover in Los Angeles, and cost me only 35,000 miles and $102.90 in taxes and booking fees. I will receive 12,828 Delta SkyMiles for this journey, which is halfway to a free domestic roundtrip ticket. I value SkyMiles at 1 cent per mile, making the effective cost of the ticket $128.28 less. As a special bonus, I also received a free one-way ticket home for Christmas which would otherwise have cost me $119. This more than offsets the redemption cost of my Alaska Airlines miles! Overall, this is like paying only $218.52 and 35,000 Alaska Airlines miles for a round-the-world journey of 22,276 miles, with the chance to visit five different cities. This will be my first time flying Alitalia, my first time flying in premium economy, and my second round-the-world journey this year. I can hardly wait! Next Next post: Free Short-Term Parking At Phoenix and Sea Tac Airports!